Happy Friday! You're in for a treat today. I have a delicious drink recipe to share with you and quick wrap up of the best weekend sales. We're supposed to get more snow again tonight, so I have to make the most of today. When I was in Barcelona, I took a cooking class to learn how to make some tapas. Over the course of about 4 hours, I made and sampled at least 8 delicious tapas (that I can remember) and sipped a delicious fruit drink while I worked. Today is the last day of the semester at the school where I work, so the Advanced Studies class plans to use the cooking lab today while I help them to prepare three of my favorite recipes from the class in Barcelona. They're going to make patatas bravas, pan de tomate, and the delicious fruit drink that I'm enjoying in this picture. The drink is so easy to make and looks so elegant! Pour a little bit of grenadine on a plate. Put some sugar on another plate. Dip the rim of the glass in the grenadine and then coat the edge of the glass with sugar. It looks pink! Add a tablespoon or two (it's up to you!) of grenadine in the bottom of the glass. Add the fruit juices in any amount or combination according to your preference. Garnish the drink with a slice of fruit. After a busy week, I enjoy going shopping, even if I'm only going window shopping. So many stores are offering fantastic sales on things to wear now and later. Lately I've been wearing a lot of blues and white, so I have a selection of some of the things that caught my eye. The best part is that everything has an amazing price point. 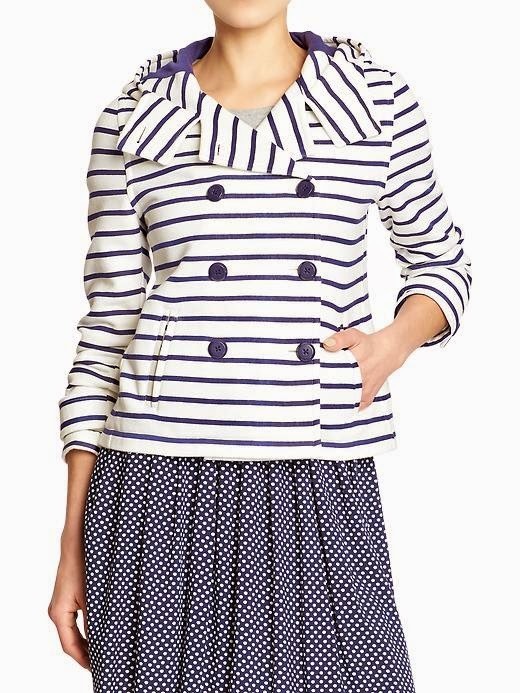 A nautical hooded fleece peacoat with navy stripes is a fantastic transition piece that will keep you nice and warm. The slightly fitted coat flatters your figure and coordinates well with almost anything. It's only $35 and is an additional 20% off that price today with the code SAVEBIG. Upgrade your look with this vented cable-knit pullover sweater. 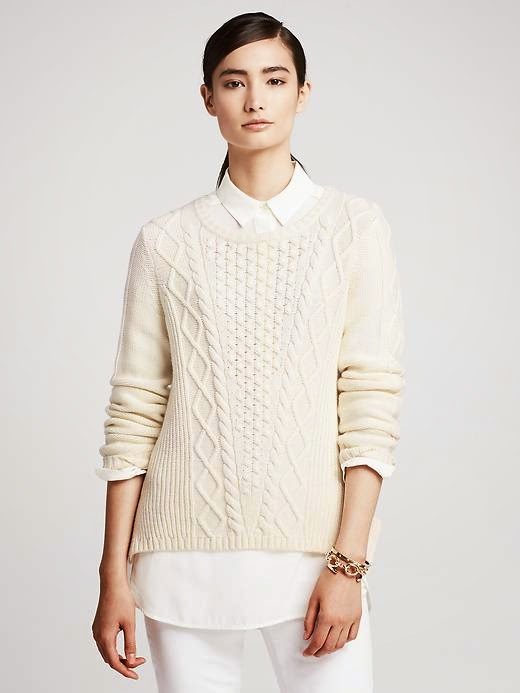 The cable knit detail is a fresh take on a winter classic. The cropped sweater looks adorable over an Oxford shirt. Get an additional 50% off the already low sale price with the code BREXTRA. Lilly Pulitzer always remarked that "Too much is never enough!" You can never have too many sweaters in your wardrobe, especially when you can get this Marielle sweater at 50% off retail price and free shipping. I love this shade of blue because it complements so many skin tones and matches lots of Lilly. Go ahead, "Break the Rules!" 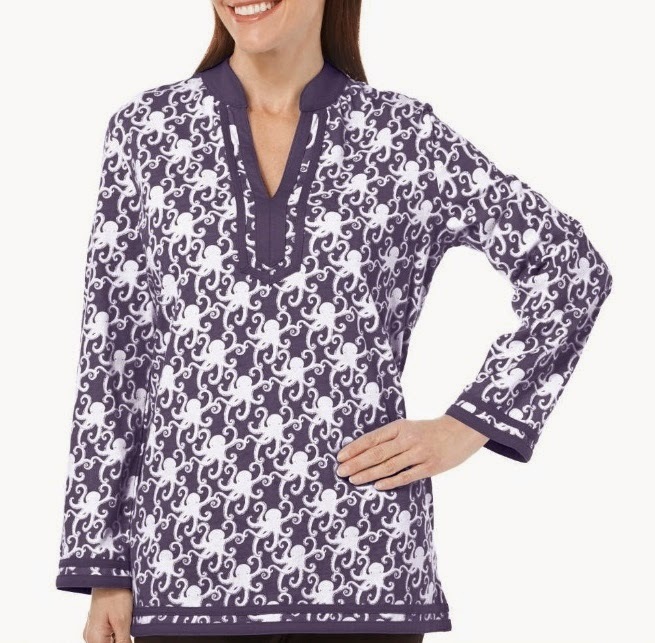 Tunics offer comfort with a punch of fun! As soon as I saw this octopus print tunic, I knew that I needed to add it to my closet ASAP. You'll love the price, too! What are your plans for the weekend? Do you plan to do any shopping? Another great blog, Bethany. That drink looks so pretty! My favorite look was the simple off white cable sweater over a button down, all in shades of off white. Very nice! Thanks so much, Babs! The drink is so delicious and looks great for a party or special event. The sweater caught my eye because the cable pattern is different than so many others that I have seen. Hope you have a wonderful weekend. You are too cute in that chef hat!!! The drink looks fantastically delicious too. Thanks, Karen! 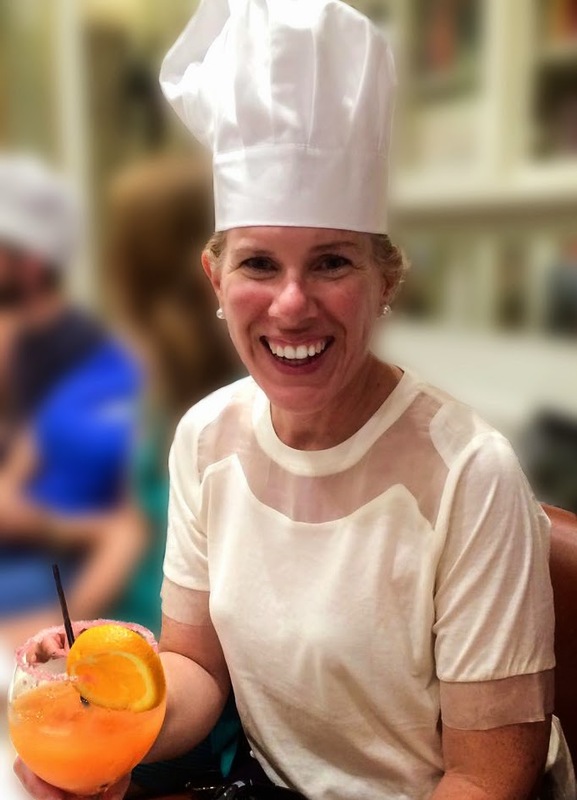 The cooking class was SO much fun. I love the sweet drink and have made it at home so many times since the class.